Is The Chipotle Macro Calculator Accurate? Chipotle is the greatest restaurant of all time. That isn’t my opinion, that is a fact. 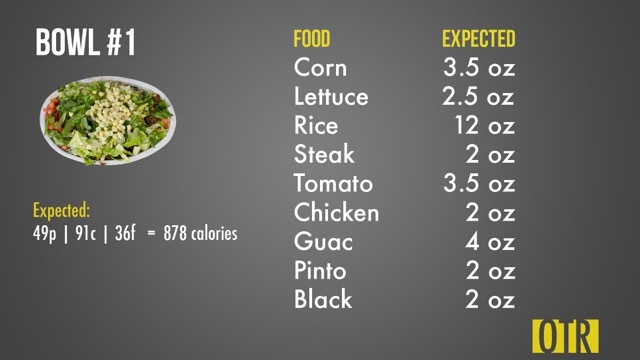 But I have clients who count their macros worry that the Chipotle Macro Calculator isn’t accurate. 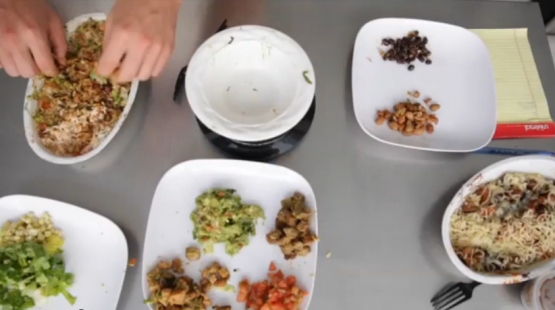 Can We Trust The Chipotle Nutrition Calculator? The macros in your burrito bowl are subject to human error. A rice scooper might make the subconscious assessment that you look frail and overload you with unwanted carbs. A normally aggressive meat-scooper may have just been reprimanded by her angry, penny-pinching manager, and serve you up a measly 13g of protein worth of chicken. So, we shall conduct an experiment. 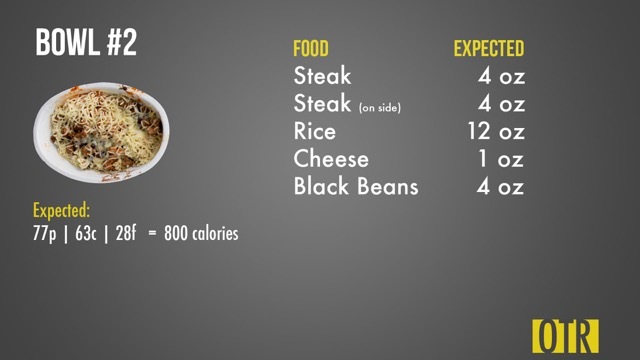 Here are the expected macros per the Nutrition Calculator on Chipotle’s Website. And again, expected ingredient quantity and macros for our second bowl. Please vote yes/no in comments… Does this qualify as a “shirt”? This bowl was half chicken, half steak. This bowl was double meat, steak. Bad idea, Mike. Very bad idea. The plastic containers hold roughly half as much meat as you get in a full scoop. Always get your extra meat in the bowl. 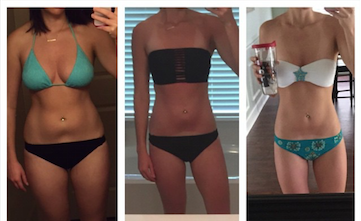 Oh, the gains I could have had… sigh. This applies to rice as well. When you order ‘half and half,’ the burrito artists have a tendency to overestimate a 50% serving, leaving us with more total food than had we ordered a single serving. 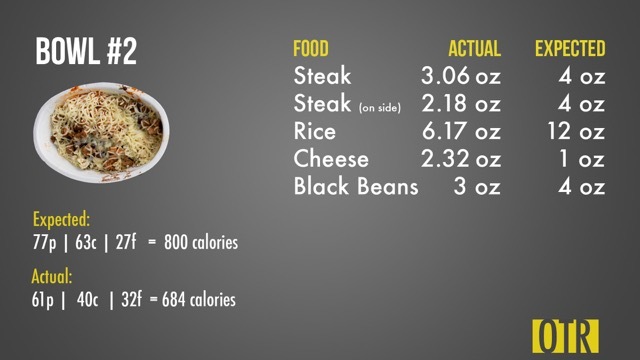 We can use this to our advantage and get extra meat, or we can apply it to rice or beans for free calories while trying to build muscle. At nine calories per gram, dietary fat can add up pretty quickly. 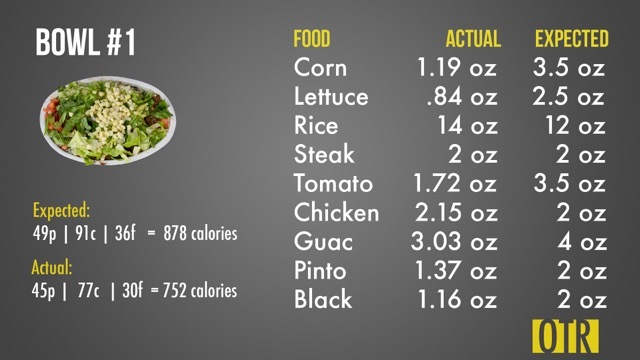 But go ahead and take a full serving of guac because in case you didn’t know, guac is extra. And we all know it is ‘healthy fat’ and ‘healthy fats’ can never make you gain body fat 😉 or caaaan they? You might come in a bit shy of expected fat, but that is better than getting overshooting by 10-20 grams. Should You Stop Eating Chipotle? The answer, my friend, is a resounding absolutely not. But Mike! The macros weren’t accurate! 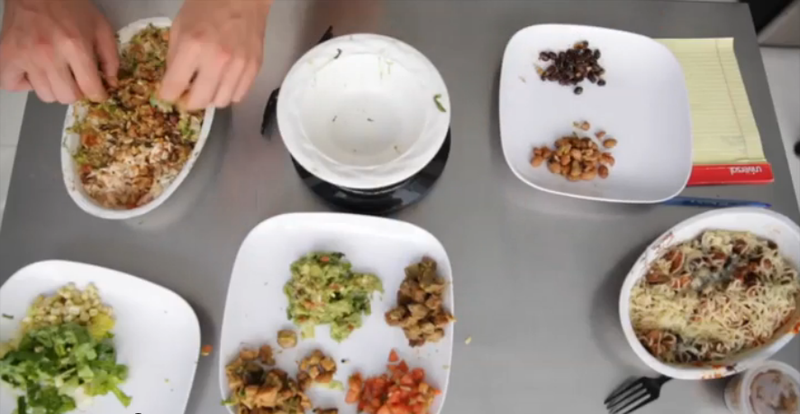 Correct, the Chipotle nutrition calculator is not perfect. Our bowls were off by ~120 calories each. 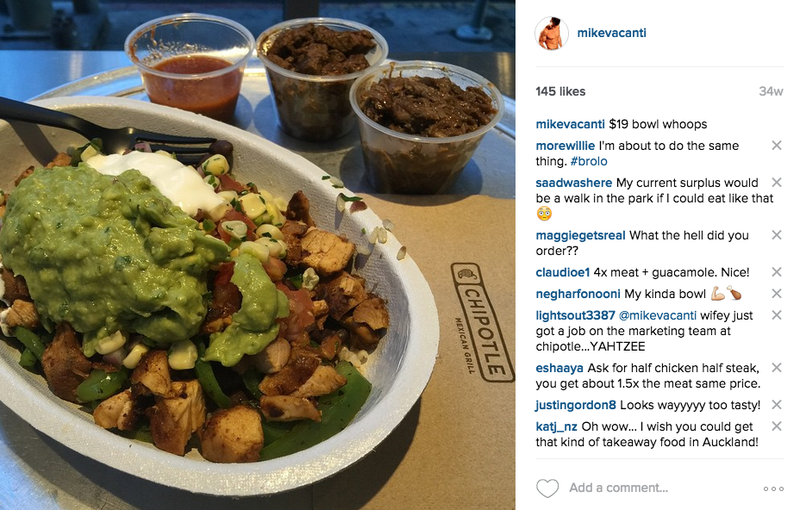 Unless you have a very good reason to be extremely meticulous with your nutrition, like an upcoming bodybuilding show, you can and should eat at Chipotle. Life is too short to be measuring egg whites and oatmeal on your food scale six times per day. Get out there, enjoy the beautiful weather, and treat yourself to a meal on par with most five star restaurants for just $9. 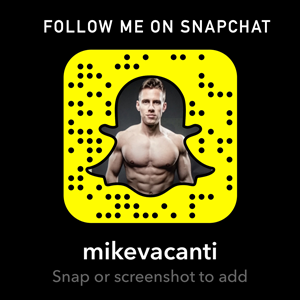 Personally, I eat Chipotle during both fat loss and muscle gain phases (which you can learn more about in the Free Beginner’s Fitness Guide). So if you like Chipotle, you should eat it too. It is important to remember that you will never be perfect with nutrition. And it isn’t perfection that creates results. You will make a dramatic transformation by being consistent, avoiding blow ups, and getting back on track as quickly as you can after screwing up. Maybe you recently had a bad day. Or a bad week. Or even a bad year. If you need a re-start, watch this short video right now. Seriously though… if you haven’t picked up The Beginner’s Fitness Guide, that is a huge mistake. It’s free and I think it will really help you. You can get it instantly right here. No, that does not qualify as a shirt. Wear it anyway! As a recovering perfectionist this post is so helpful.Thanks, Mike. p.s. Who cares if it's a shirt? You look amazing in it! Who cares , you got the body to show off wear it. It has material it's a shirt! Definitely NOT a shirt! If I, or any woman for that matter, were to wear that would you say it was a shirt? This has inspired me to go all in on a full fledged all chipotle diet. I've been really loving Chipotle lately. Just had again today.